I haven't done a "fun food" post in a while. Tipped off by Cousin Q's post about Subway testing a creamy Sriracha sauce in some markets, I hit up my local Subway to check it out. 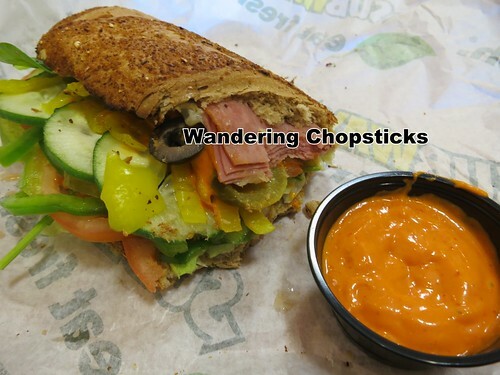 I got a six-inch Cold Cut Combo on honey oat wheat with everything and two drizzles of the creamy Sriracha sauce. Here, I'll open the sandwich so you can see. It's a bright orange color, which led me to wonder if the "creamy" part was achieved by watering down Sriracha sauce with mayonnaise? As you can tell, I added both jalapenos and banana peppers in my sandwich, so additional spicy sauce might be overkill to some people. What can I say? I like my chile peppers. After taking a few bites, I found the spiciness to be rather mild actually. The owner saw me photographing my sandwich and asked if I wanted additional sauce, which I readily agreed to. 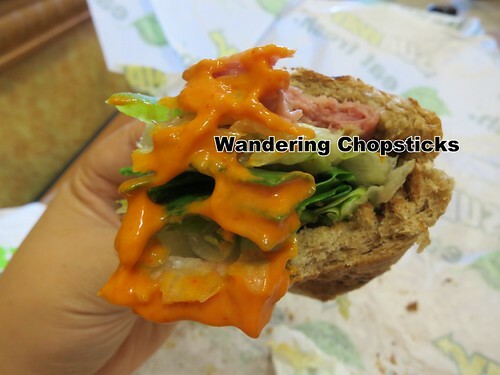 I ended up dipping the sandwich into the sauce and it was much more to my liking. It took long enough for Subway to get onto the Sriracha bandwagon, but I'm just tickled that a mainstream American chain did. Later, I mixed up mayonnaise with the bottle of Sriracha sauce I had at home. Tasted the same! Don't know why this didn't occur to me before?! 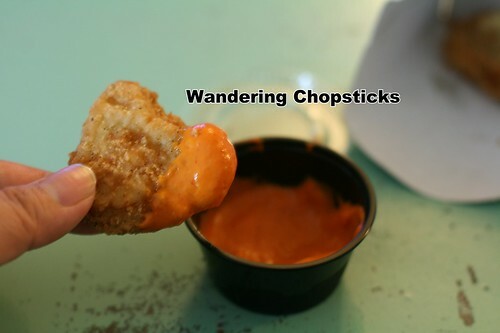 And then it struck me that this made a great dipping sauce. So I bought some chicken nuggets from Wendy's (Four for 99 cents.) and tested it out. Perfect! I guess it depends on your spicy tolerance, but the mayonnaise helped tone down the spiciness of the Sriracha sauce so I could see this going over well. I texted oldest nephew, who's a Sriracha fiend, and he declared it a "game changer." Is it just California? Is there creamy Sriracha in your state? 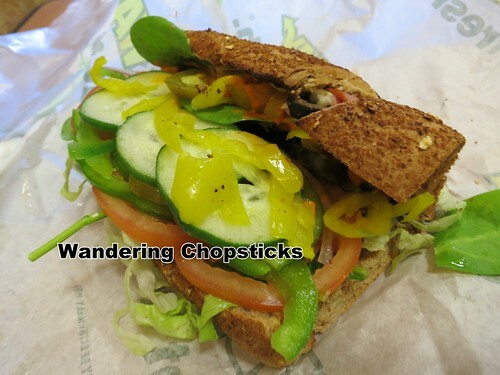 I admit that I don't really eat at Subway often enough to know, and wouldn't have if cousin Q hadn't pointed it out. 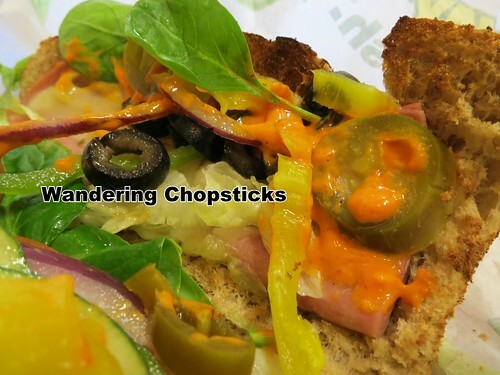 While it wouldn't replace my beloved Vietnamese banh mi, I could see this gaining popularity nation-wide to add a kick to an ordinary American sandwich. 3 years ago today, Best Of: Top 10 Recipes of 2008. 4 years ago today, Pho Minh Vietnamese Restaurant - South El Monte. 5 years ago today, Taqueria Chihuahua - Los Angeles (Mar Vista). 6 years ago today, I reminisced about the beginning of my culinary wanderings with Fessenjan(Persian Walnut Pomegranate-Glazed Cornish Game Hens), and waxed poetic about the gloaming. I am always surprised by how ubiquitous the Rooster brand (Huy Fong) of sriracha is. Here, in the Seattle area, it is sold in almost all supermarkets. Bottles are also available at many restaurants, including non-Asian ones. Vastly under-appreciated is Huy Fong's sambal oelek, which to me goes better with certain foods. Now, creamy sriracha? That's different. And interesting. I like the sambal oelek too. I always keep both in my fridge. Huy Fong is moving to a 655,000-sq-ft facility this summer. Supposed to triple their capacity so you'll be seeing their Sriracha in even more places. I was just struck by a mainstream American chain getting in on the action.